Is it just an eerie coincidence that the speed of Light equals the coordinates of the Great Pyramid of Giza? The speed of light in a vacuum is 299, 792, 458 meters per second, and the geographic coordinate for the Great Pyramid of Giza is 29.9792458°N. Some say this is just one of the many numerical ‘coincidences’ embedded within the Great Pyramid. For many people, the Pyramids located at the Giza plateau –specifically the Great Pyramid of Giza— are shrouded in mystery. Not only because of their immense size but due to the fact until today, we still have no idea what the exact purpose of the pyramid was. Among the most fascinating, we find that the relationship between Pi (p) and Phi (F) is expressed in the fundamental proportions of the Great Pyramid. Furthermore, Twice the perimeter of the bottom of the granite coffer times 10^8 is the sun’s mean radius. [270.45378502 Pyramid Inches* 10^8 = 427,316 miles]. The weight of the pyramid is estimated at 5,955,000 tons. Multiplied by 10^8 gives a reasonable estimate of the earth’s mass. As noted by World Mysteries, the design of the Great Pyramid is based on the ratio 11:7, This ratio (equal 1.571) is an approximation of the “squaring the circle” principle. The Speed of Light and the coordinates of the Great Pyramid of Giza are the same. The speed of light in a vacuum is 299, 792, 458 meters per second, and the geographic coordinate for the Great Pyramid of Giza is 29.9792458°N. Furthermore, another mind-bending coincidence related to the speed of light is found inside the Great Pyramid, discovered by John Charles Webb Jr. Precise latitude of the center of the Grand Gallery (inside GP) is 29° 58′ 45.28″ N = 29.9792458° N.
The speed of light in vacuum, usually denoted by c, is a universal physical constant important in many areas of physics (299,792,458 meters /s). While this is a fascinating connection, it is noteworthy to mention that the meter is a modern unit and the ancient Egyptians are not known to have used seconds or for that matter decimal counting. The ancient Egyptians used cubits as a measurement system. What do you think? Is this another coincidence? Or is it possible that somehow, the ancient Egyptians knew about the concept of speed of light or a vacuum? The truth is that a profound mystery has surrounded these magnificent structures for centuries with theories varying from the scientific to the bizarre. For those of you who remain skeptical about the discovery, take a look at an article at metabunk.org, which suggests that The Speed of Light and the coordinates of the Great Pyramid of Giza are nothing more than a coincidence. New analysis of the Pyramid of Kukulkan has allowed experts to make a fascinating discovery: There is another Pyramid located withing the Pyramid of Kukulakn at Chichen Itza. Experts say that the structure appeared to have a staircase and perhaps an altar at the top. Mexican Archaeologists have discovered a second mysterious sub-structure (Mini Pyramid) located within the Mayan pyramid of Kukulcan, in Chichen Itza which dates back between 550 and 800 AD, reports indicate it measures 13 meters in height and 18 meters in width. Interestingly in 1930, excavations revealed another ‘structure’ located within the pyramid which contained a red Jaguar throne. 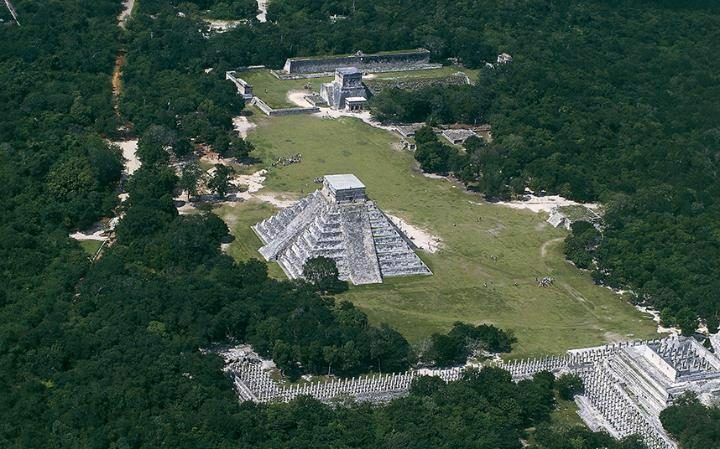 During a press conference, experts from the National Autonomous University of Mexico and the National Institute of Anthropology and History (INAH), commented that the geophysical tests applied to the so-called ‘El Castillo Pyramid’ – also called Kukulcan – revalidate the presence of an ancient cenote under the pyramid, whose discovery was announced in August 2015. “The structure that we have found, the new structure, is not completely in the center of the Kukulkan pyramid. It is in the direction where the cenote is,” said Rene Chavez Segura, a scientist at the National Autonomous University of Mexico, or UNAM. Researchers used a world-class innovative technology developed by themselves –tri-dimensional electric resistivity tomography. Using commercial and non-invasive geophysical exploration tools, experts placed electrical detectors around the pyramid and transmitted current to “illuminate” the interior of the pyramid and obtain data through analyzing the difference and the resistivity of the subsoil. According to experts from UNAM and the INAH, the structure discovered by experts in 1930 belonged to the transitional pyramid of the ancient Maya while the newly found pyramid inside the pyramid is from the pure Mayan style. “If this could be investigated in the future, this structure would be significant because it would speak to the first few periods of habitation of the site and would provide information about how the settlement developed,” said Denisse Argote from the National Institute of Anthropology and History. “With the discovery of this structure, we’re talking about something from the pure Mayans. A lot has been excavated, and there is a lot of information on the transitional periods (of the Mayas) and there is a Mexican style at the site, but there is little information on the original site,” she added. What is Ascension? We have heard of this term used in numerous places, in numerous contexts, and with multiple ideas attached to it. But what does it truly mean? What are its origins and how do we ensure that we are doing our due diligence to attain it? This article is somewhat of a continuation of the topics discussed in the Wisdom Teachings episode entitled, “Build your own Pyramid,” and features some of the most interesting and astounding effects of pyramid technology. These topics get to the bottom of at least one aspect of the ascension process and gives clues as to how we can accelerate our own journey of evolution. The topic of pyramid science is one of extreme depth—so much so that this time around, it required more than one article for an episode. That, and I did not want to keep my readers waiting any longer. On a personal note, I have been experiencing some extreme writer’s block as well as some issues with low energy. This was in combination with a two-week period of non-stop, fast-paced world events all taking place in rapid succession. So being as mentally stuck as I was, combined with still possessing a strong desire to assist in the disclosure process, I found no other alternative than to give the story in whatever form that I could. It is my hope that after some good meditation and some hard-core nature walks, I will be ready for more heart-pumping, mind-blasting articles for many to benefit from. This method seems to be working so far. 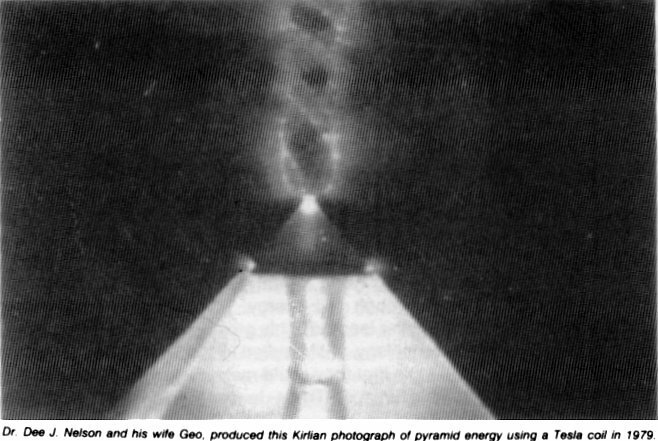 So, let’s see what comes of it—on with the karmic influences of pyramid energy. The concept of ascension is a very hot topic in present day societies. This is due to the numerous prophecies which all point to our present time period as being crucial for human development and evolution into higher states of consciousness. From the Hopi prophecies to the Law of One test, this present time period is to be the final deciding factor of how our evolutionary course is to progress. The Law of One text refers to this time as “graduate” or the “harvest,” meaning that this is a time during which all souls must experience according to their own choice. When we are ready, we will experience an expansion of consciousness, of awareness, and of overall being. Our definition of existence may completely change as we develop and move along our path of discovery as beings of light. This concept of graduation is spoken on in numerous passages within the Law of One. Below is one such passage which gives a rather clear understanding of what it is to progress to higher states. 47.5Questioner: Then at fourth-density graduation into fifth is there anything like the percentages you gave for third-density graduation into fourth for polarization? 47.6Questioner: Well, what I was actually asking was if 50% is required for graduation from third to fourth in the positive sense, 95% is required for graduation in the negative sense, does this have to more closely approach 100% in both cases for graduation from fourth to fifth? Does an entity have to be 99% polarized for negative and maybe 80% polarized for positive graduation from fourth to fifth? This passage primarily refers to the graduation from third to fourth density as well as from fourth to fifth. According to the text, for the third to fourth density graduation, there is the task of choosing polarity between service to others and service to self. As many of us know, these are the choices of positive and negative orientation. A soul can either choose to love and live to be compassionate, or they can live to love only themselves and to view themselves as the center of the universe. According to the text, these are both acceptable paths. However, since the service-to-self path requires a 95% polarity, this is not a very achievable path for many. Only those who completely abandon all of humanity and become the equivalent of a mass murderer can even begin to be successful on this path. However, no matter how successful an individual becomes on the negative path, they will always be consumed by their distinctive lifestyle. In other words, their destruction is always returned to them in full. The positive path is one of care and concern for the whole of society. To put it simply, it is a path of learning love through how an individual takes care of others. Through this path, the individual constantly develops a greater understanding by means of renewable creation and expansion. As the soul progresses to fourth density, the curriculum becomes a bit more in depth, according to the text. It is said that one night of August in 1799 changed the course of world history as Napoleon Bonaparte was inside the Great Pyramid of Giza, experiencing a secret that would forever alter Napoleon’s destiny. If we look back into history, we will find out that on summer of 1798, more than thirty thousand French soldiers came to Egypt under the command of General Bonaparte. His official mission was to free the country of the Nile from three centuries of Turkish rule and, incidentally, to block the free navigation of the English with their eastern colonies. However, the young Napoleon did something no other person had ever done: he took with him more than a hundred scholars from all disciplines to study, write down and copy all they could from the land of the Pharaohs. Temples, tombs, mummies, tunnels, lavish treasures and the sacred pyramids opened up, revealing to the world a fascinating history. In fact, it was Napoleon’s expedition, which was as military as scientific when the European continent rediscovered the lost treasures of ancient Egypt and even found a key that allowed the entire world to understand what ancient Egyptians wrote down thousands of years ago. As one of Napoleon’s soldiers was digging a trench around the medieval fortress of Rachid, he found by chance one of the most important ancient Egyptian artifacts in history: The Rosetta stone which helped scholars finally decipher Egyptian hieroglyphics. The Rosetta stone was written down in three versions: hieroglyphic, demotic and Greek. From the Greek writings, researchers were finally able to find an equivalence in hieroglyphics and establish a sort of code to read ancient Egyptian texts. However, Napoleon’s campaign to Egypt also served a spiritual quest to the land that had disturbed the imagination of great characters of history before him. Like many of his contemporaries, the Napoleon was attracted by the oriental exoticism and had read a very popular work by then, “The Journey to Egypt and Syria” by Constantin Volney, published in 1787 which told of numerous mysteries of the civilizations of the area. During his campaign, Napoleon traveled to the Holy Land and confront the Turkish Army and, incidentally rest for a night in Nazareth. This trip took place on April 14 of 1799. During the same year, in August, Napoleon returned to Cairo when he decided he would sleep inside the Great Pyramid of Giza. He was accompanied to the King’s Chamber, which at that time was difficult to access, with small and difficult passages that did not reach even the meter and a half in height, complicated beyond doubt by the lack of light which a few torches did not solve. The King’s Chamber is located inside the Pyramid and is a rectangular room about 10 meters long and 5 meters wide formed by granite slabs, walls and smooth ceiling, completely undecorated, and only contains an empty granite sarcophagus without any marks, deposited there during construction pyramid, since it is too large to fit through the passages. The Great Napoleon spent around seven hours inside of the Great Pyramid and just at dawn he ‘came out of the pyramid’ pale and frightened. 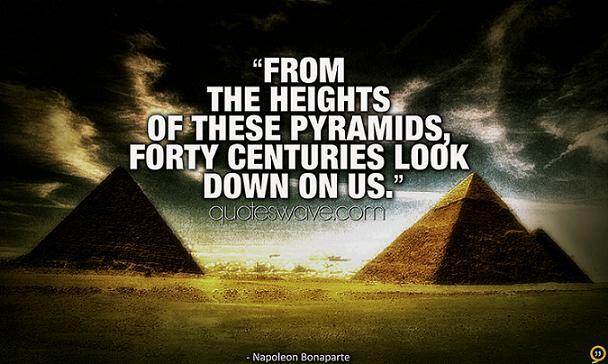 It is believed that the night Napoleon spent inside of the Great Pyramid changed his life forever. Even though he returned to France defeated, politically speaking Napoleon achieved great victories in the following months. He managed to end the government of the French Revolution and initiated the Consulate as Napoleon Bonaparte as a leader. Interestingly, according to Peter Tompkins in his classic “Secrets of the Great Pyramid,” “Bonaparte wanted to be left alone in the King’s Chamber, as Alexander the Great before him.” Obsessed throughout his career with other key historical figures, Napoleon tried to emulate the footsteps of the conqueror Alexander the Great and the Roman general Julius Caesar, who allegedly had also spent a night in the chamber and being sought them. Obsessed throughout his career with other key historical figures, Napoleon tried to emulate the footsteps of Alexander the Great and Julius Caesar, who allegedly had also spent a night in the chamber alone, while searching for the greater purpose. Regrettably, whatever Napoleon experienced and saw between the walls of the King’s Chamber is a secret that he took to his grave. Countless legends were formulated on Napoleon’s experience, including one that suggests Napoleon had some kind of vision where he saw himself as being the greatest emperor ever to live on the planet. So… what causes these mysterious experiences inside the Pyramid? And is it possible there is a ‘greater force’ residing inside the Pyramid? Interestingly, the granite blocks inside the royal chamber are a material that is able to conduct electricity. This is mostly granite has a high concentration of quartz crystals, which is proven to have piezoelectric properties; in fact, all electronic objects we know today contain quartz. The ancient builders of the pyramid knew of these properties and may have utilized them in a way we are unaware of today. The mysterious electromagnetic properties inside the King’s Chamber was in fact proved empirically. On one occasion, one of the visitors that entered the pyramid received a small electric shock when he drank water from a metal cup. In addition, researchers also reported that the batteries of their cameras and research equipment were exhausted unaccountably while inside the pyramid. Could these electromagnetic anomalies explain visions and mystical experiences while inside the Pyramid? And is it possible that these anomalies are evidence that the great Pyramid of Giza is not a tomb as proposed by mainstream scholars? Another theory that tries to explain the “power” of the Great Pyramid, is that its geometric shape gives the structure the ability to concentrate cosmic energy, which, among other things, would help preserve the body of Pharaoh, deposited right in the center construction. However, none of the three pyramids of Giza contain any mummies. This has led many researchers to propose theories suggesting that the Pyramids were not tombs but rather giant energy machines. The Pyramids have always been a subject of fascination throughout our history. I particularly started to become interested in them when I realized that nobody knew exactly how they were constructed. Conventional archaeologists claim that the Egyptians carved the limestone from the quarries and rolled them over to the spot where the pyramids where to be built. Then they set the large stone into place with a pulleys and levers. “This energy(The Force) is intelligent. It is hierarchical. Much as your mind/body/spirit complex dwells within an hierarchy of vehicles and retains, therefore, the shell, or shape, or field, and the intelligence of each ascendingly intelligent or balanced body, so does each atom of such a material as rock. When one can speak to that intelligence, the finite energy of the physical, or chemical, rock/body is put into contact with that infinite power which is resident in the more well-tuned bodies, be they human or rock. Of course these theories are all, well…. theories and there are many of them. There has been no “official” evidence that has given credence to any one hypothesis. This below article though gives hope to the possibility that we may discover some sort of evidence that once and for all ends the debate on how the Pyramids were constructed. An international team of researchers said Sunday they will soon begin analyzing cosmic particles collected inside Egypt’s Bent Pyramid to search for clues as to how it was built and learn more about the 4,600-year-old structure. Mehdi Tayoubi, president of the Heritage Innovation Preservation Institute, said that plates planted inside the pyramid last month have collected data on radiographic particles known as muons that rain down from the earth’s atmosphere. The particles pass through empty spaces but can be absorbed or deflected by harder surfaces. By studying particle accumulations, scientists may learn more about the construction of the pyramid, built by the Pharaoh Snefru. “For the construction of the pyramids, there is no single theory that is 100 percent proven or checked; They are all theories and hypotheses,” said Hany Helal, the institute’s vice president. “What we are trying to do with the new technology, we would like to either confirm or change or upgrade or modify the hypotheses that we have on how the pyramids were constructed,” he said. The Bent Pyramid in Dahshur, just outside Cairo, is distinguished by the bent slope of its sides. It is believed to have been ancient Egypt’s first attempt to build a smooth-sided pyramid. The Scan Pyramids project, which announced in November thermal anomalies in the 4,500 year-old Khufu Pyramid in Giza, is coupling thermal technology with muons analysis to try to unlock secrets to the construction of several ancient Egyptian pyramids. Tayoubi said the group plans to start preparations for muons testing in a month in Khufu, the largest of the three Giza pyramids, which is known internationally as Cheops. “Even if we find one square meter void somewhere, it will bring new questions and hypotheses and maybe it will help solve the definitive questions,” said Tayoubi.